Radiologger transmits temperature and humidity readings. Enabling wireless monitoring, rl4106 temperature and humidity transmitter features real-time alarm notification and allows historical analysis of data. Unit includes onboard temperature sensor and humidity sensor, which can be mounted internally to transmitter body, externally on case, or remotely on probe. Powered by 3.6 V AA Li-Ion battery, it includes LCD screen that simultaneously displays recent readings and predicted battery life. 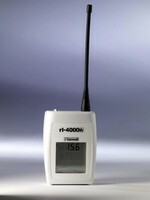 Hanwell Instruments is pleased to announce the launch of the rl4106 temperature and humidity transmitter, the latest addition to its 4000 series of radio radiologgers. The 4000 series is used throughout industry to enable wire-free monitoring of a site, with real-time alarm notification and allowing historical analysis of the data. Each rl4106 unit reads its on-board sensors to provide accurate and reliable information about environmental conditions. This data is transmitted, at user-defined intervals, to the base station that logs and stores the data pending transfer to a PC for analysis and archival storage. The rl4106 has two sensors as standard: a precision temperature probe and a high quality humidity probe. These sensors can be mounted internally to the transmitter body, externally on the case or remotely on a probe. An additional surface temperature probe can be added to check the dewpoint margins. These sensors can be calibrated by the users or at Hanwell's in-house calibration laboratory. The ID number and transmission rate are set in the rl4106 using a simple software program (free to download) and a USB cable. Each unit has an LCD screen simultaneously displaying the most recent readings taken and the predicted battery life. The rl4106 is powered by a single 3.6V AA Lithium battery, which can be fitted by the user. The battery life will be dependent on the transmission rate set. An indicator on the LCD will warn when the battery is low, and the rl4106 maintains a record of when the battery was last changed. The moulded case allows easy access to the battery and USB socket, as well as having slots to fit onto secure wall brackets and a plain front panel to hide the LCD if more discreet monitoring is required. The new rl4106 is a valuable addition on the 4000 series, adding the ability to measure both temperature and humidity. All products have been design to comply with the RoHS and WEEE EU directives and carry the CE mark. All products are featured on Hanwell's new website at .hanwell.com, where comprehensive datasheets, including technical specifications are available for download.